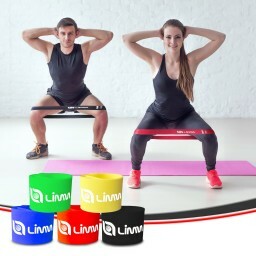 Our pro-quality exercise straps are a perfect solution for busy people who wants to maintain optimal fitness and health, without the high cost of a gym membership. Our pro-quality exercise straps are a perfect solution for busy people who wants to maintain optimal fitness and health, without the high cost of a gym membership. See images above. 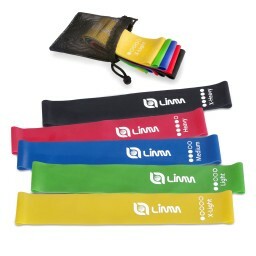 The loops are lightweight and each has a different tensile strength, so you increase the intensity of your workout. X-Light (yellow), Light (green), Medium (blue), Heavy (red), X-Heavy (black). Each strap is a full 12 inches long so you can stretch your arms and legs further. The 5-loop set includes a printed manual, our "Home Workouts" eBook and a convenient travel bag. Throw them into your briefcase or shoulder bag and take them with you to your Pilate class, Yoga studio, physical therapy office or gym.